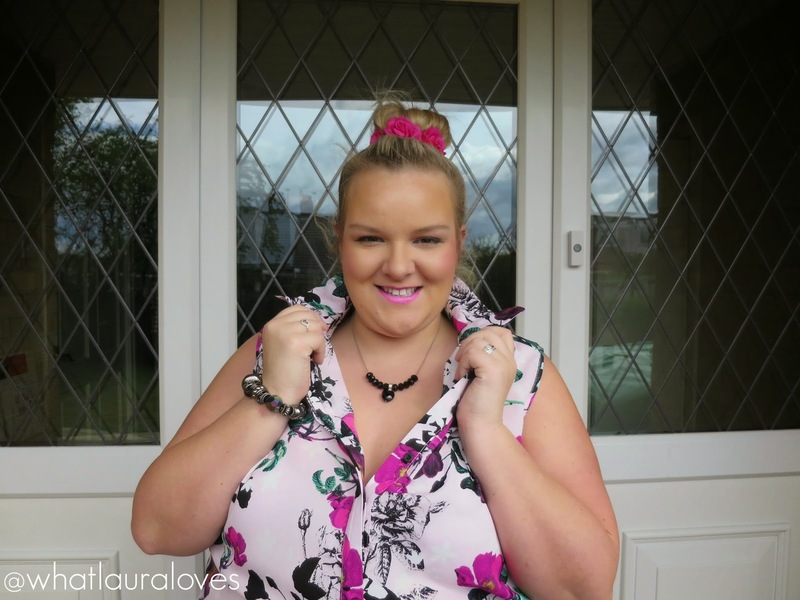 On my recent trip to Brentwood to visit Gemma Collins Boutique, I picked up this gorgeous shirt that I thought would be perfect for the summer with it being sleeveless and having this beautiful flowery print. The background to the shirt is an off white and pale pink design that you can’t really see until you’re up close to it and then it has a bold floral pattern over the top that combines bright pink with purple, green and black. Although I’m a fan of pink, this shirt is unlike anything else that I own which I think was what attracted me to it in the first place. It is quite a bold piece and this is how I styled it for a day date with Mr WLL. As stock is very limited at Gemma Collins Boutique, I was unable to buy this in my size and ended up with one several sizes larger than I would have usually bought however I loved the look of the shirt and thought that I’d be able to get it to work for me. Its not often that I actually get a shirt to fit me as I am far larger at my stomach which usually means that items are then huge on my bust but some how this works. It is very long on me so rather than wear it as an actual shirt, I decided to wear it as a dress. Come to think of it, I haven’t seen a plus size shirt dress like this before so using it as a dress is hopefully going to be quite unique when I’m attending events with other plus size girlies. While the oversized look of this shirt is fabulous, I did feel as though it had lost its shape as it was too large so I went in search of a skinny black belt to wear around my waist to cinch it in a little. The ASOS vintage belt set has a tan and a black belt in it. I used the black belt with this outfit and think that it works perfectly. I wore it quite loose around my waist and pulled some of the shirt up through it to give it a gathered, relaxed look. I really think that the belt helps to give a little bit of shape to the outfit. The shirt does have two splits on either side which come quite high up my thighs. If it were worn as a top then this would be fine but as I decided to wear it as a dress, then I felt as though I needed something else underneath to cover my modesty more than anything. Although the shirt isn’t see through by any means, having a little extra coverage doesn’t go a miss and especially as this fabric is relatively light, wearing something underneath will save a multitude of embarrassment should a gust of wind happen by. When I first got this shirt, I ordered these legging shorts from ASOS Curve to wear underneath it. They’re showing as being out of stock at the moment but I do hope that they bring them back as they’re so useful. Essentially, they’re just shorts made out of leggings with a pretty lace trim on the legs. They feel and look just like leggings so I do suppose that you could always just cut up a pair of your own leggings to wear should you wish to and if you’re handy with a sewing machine, you could sew the rough edge under. Not only do these look pretty under the shirt dress should the wind blow but they also help to prevent a bit of chub rub if that’s something you suffer from. I decided to keep my accessories simple with my black clutch and flower sandals. For jewellery, I kept it simple too with some oldies but goodies in black from my jewellery stash and as I had my hair up in a bun, I put a pretty floral bun ring around it. I love add these to my up dos as they really make me look like I’ve made an effort when really I just haven’t washed my hair… #confessiontime! Let me know in the comments whether you think this shirt works as a plus size shirt dress! Looking flawless as always Laura! This shirt dress is so spot on for spring – LOVE IT! Love the dress, you look lovely! great for spring. Oh beautiful dress, really lovely for summer. I really need to get one of those shorts to wear under skirts, I'm going to spend the summer in Sweden and it's very windy over there, I might have flashed my underwear to some people on past occasions! That is soo cute-love it. Brilliantly pulled off! and that clutch is adorable!